Adding new custom window treatments means making an investment in your home. Why not invest in cutting-edge technology? Blinds Directs’ Smart Automated blinds are easy to install, simple to use, and give you complete, effortless control with the touch of a button. Now that’s brilliant! We bring your blinds to life at the touch of a button! Aesthetics enhance the overall visual appeal of interior spaces. Unsightly cords can take away from the clean look of an otherwise stunning. Use sunlight to power your blind or shade! Our Smart Blinds can work in just about any window, whether it’s way up out of reach, behind the couch, or just across the room. Using automated blinds with a home automation system opens up a whole new world of possibilities. Automated window coverings are here to stay. Be the first of your friends to embrace the “Smart Home” technology. Automated blinds deliver convenience, security and comfort. Our Smartphone controlled venetian blinds is an affordable and cost effective luxury that provides you with added convenience. A contemporary and stylish window treatment that combines superior functionality with a clean and elegant appeal. Control privacy and adjust natural light with our easy to install automated venetian blinds. Control your automated blinds from anywhere with the MySmartBlinds app. You’ll have instant control of any blinds as well as options to create programmable schedules. 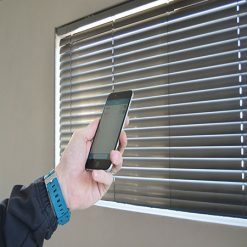 Smartphone controlled venetian blinds. Easy to install. Easy to use. Enough said. In the last few years, one of the ongoing favourite window coverings seems to be the roller blind. Similarly, the vertical blinds are majorly popular for the office environment. The design of the vertical blinds means that they are easy to handle and slides effortlessly from side to side. Now you can add some convenience to your roller blinds and vertical blinds with MySmartBlinds, you can fully automate these beautiful window coverings. This allows you to remotely control your motorised roller and vertical blinds by using your mobile device via iOS or Android. Additionally, the motor can be fully hidden behind the blinds so you don’t have to worry about it ruining the interior design of the room space. Curtains form a significant part of your interior design due to the amount of visible space it covers. They are a necessity for any room of your home as they protect your privacy and suitably adjust the amount of light you want to be exposed to. For such an important asset to your home, why not make it even better by automating it? With our curtain automation, you can either have a stand-alone control system just for your curtain, or alternatively have the motors integrated into the automation systems of your entire home. If that’s not convenience, we don’t know what is! Our ultra-quiet automation system gives you the effortless ability to manage your window coverings at the click of a button. Don’t wait any longer order your automated curtains now. Gain peace of mind while you’re away. Making your house appear occupied is a key element in deterring theft: set your blinds to move by themselves when you are on vacation, on a business trip, or just out running errands. We believe that setting up smart window coverings should be simple. With our tool-free installation and easy app control, MySmartBlinds eliminates the need for hiring a contractor or buying any other device to ensure connectivity. Save on energy costs like air conditioning, heating, and lighting by more efficiently using or blocking the energy from the sun. Automating your blinds will also save you time and slow your furniture, upholsteries, and flooring from fading.